If teething is dealing your baby fits, then try these 5 natural fruit and vegetable baby teethers to soothe tender gums. 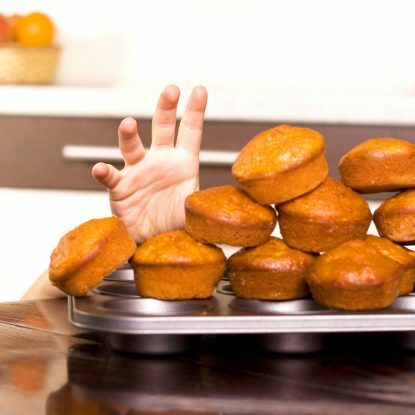 Teething for both Ellie and Frances was a trying process. I’m talking middle of the night wakeups, crabby moods, ear infections, blow-out diapers…the works! Unfortunately, poor Frances has spent the last few months in a teething nightmare as the majority of her teeth and molars have been busting through all at once. In an effort to relieve pain during teething, we would give the girls ibuprophen (as needed), however, it never seemed to do the trick to massage their gums the way certain foods could. 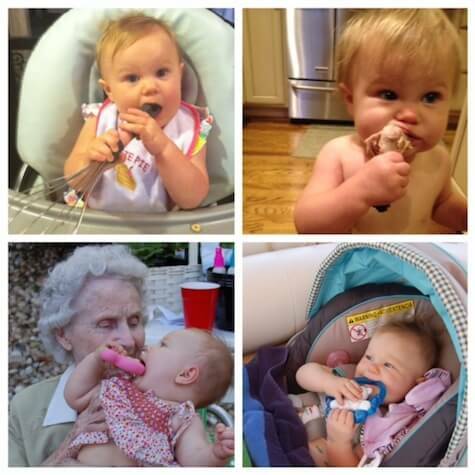 I bought and tried many of the plastic teethers over the years (you’ll see these in the pics of Ellie below) but they were always lost or filthy more often than they were ever used. Each mango has a large, flat seed that runs the length and width of the fruit. Cut the pulp off the front and back of the seed, remove the peel from the sides, and save the fruit for a snack or smoothie. 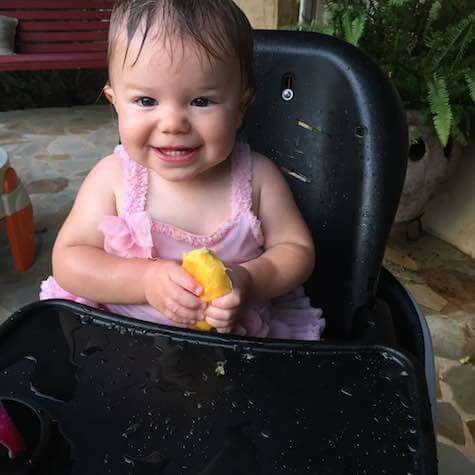 Some of the fruit will clings to the seed so it gets slippery when Frances eats it and requires 2 hands but she LOVES it and enjoys the challenge of trying to hold on to the large slippery seed. Frances and a giant, cold carrot stick make me laugh since she gnaws on all ends and then bangs it like a drumstick. She goes from looking like she’s playing the flute to smoking a cigar. I like how the carrot can get into some of the gaps between teeth to relieve pressure however this usually results in orange drool so if you are going to try a cold carrot stick, take off your baby’s shirt or use a bib. 3. 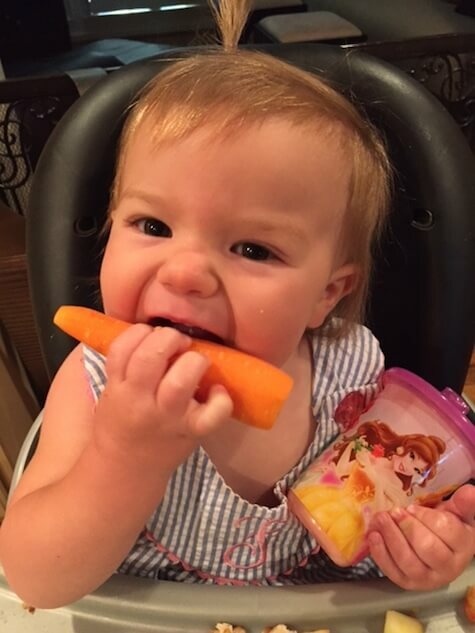 Frozen Celery: In the same way that a carrot stick works as a teether, celery does as well. However, I’ve found that frozen celery works better since it doesn’t get stringy as fast. The little strings aren’t really an issue but it is important (as with any of these methods) to not watch your baby to make sure she doesn’t chomp off and choke on any of the food. 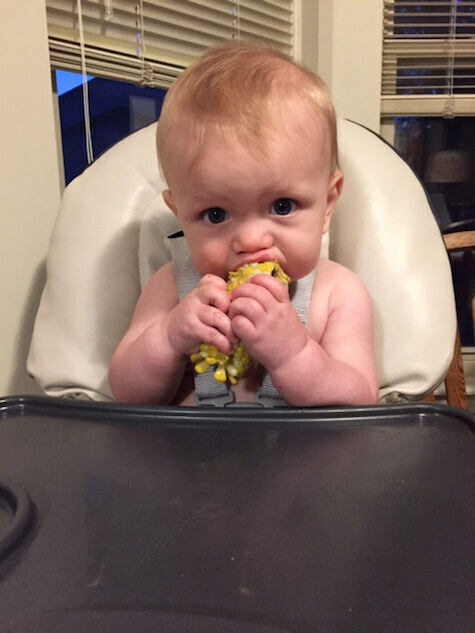 Summer season is the perfect time for babies to enjoy healthy fruit and vegetables–especially corn on the cob. Lindsay said Squish loves to nibble on the individual sweet kernels. I’ve served Frances corn on the cob before but never cold–on the menu ASAP. Whole apples are a favorite for my girls and Frances especially loves them straight from the fridge because the cold pulp helps to soothe her sore gums. 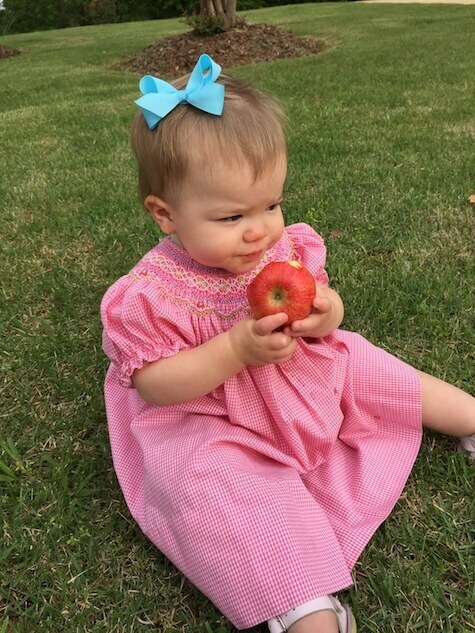 She can actually eat an apple now so apples double as a snack and teether but I make sure to keep an eye on her in case any large pieces break off. Don’t want her to choke! 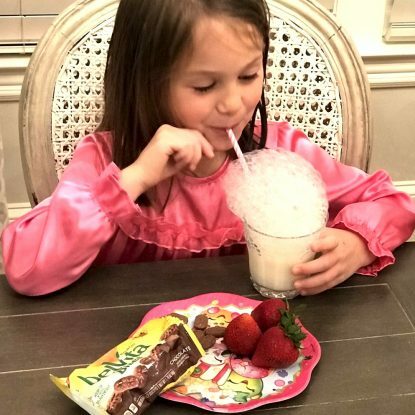 Lindsay shares, “We’ve also been using homemade Popsicles- usually banana and almond butter, sometimes with some prunes to do double duty & help poop.” I definitely need to try this! 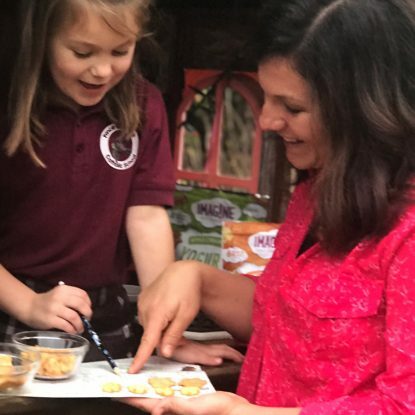 Frances loves popsicles so I’m all about making my own using healthy fruits, vegetables, and peanut or almond butter. Frozen wet wash cloth with squeeze of fresh lemon or orange juice: It took me a few tries to get the frozen washcloth right. At first I just put a washcloth in the freezer. Fail! Not really sure what I was thinking would happen but the key is certainly wetting the washcloth. I usually will get a small, soft clean washcloth damp and then add a splash of orange or lemon juice before freezing it in a zip top baggie. 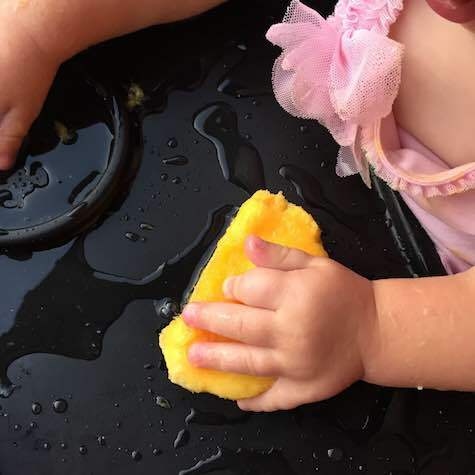 Frances seemed to like the washcloth much better when I added the citrus than when I gave it to her with just water. Frozen whole grain waffle or bagel: These were better teething option for Frances before her front teeth came in and she could gum her way to eating a full breakfast versus just having a teether. She now can take a few chomps and bite through the waffle but she still seems to enjoy the cold taste and yummy flavor. 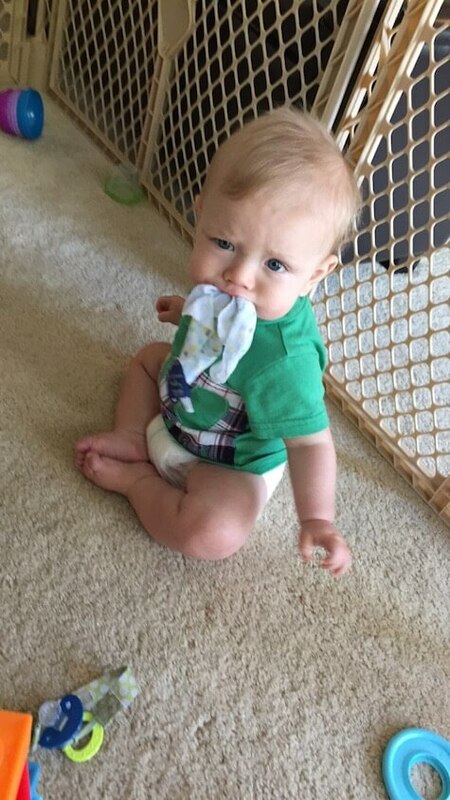 Do you have a favorite trick to help your child with teething? I would love to add it to this list to help other babies and parents get through this painful rite of passage. I’m happy to report that we only have a few teeth left to come in before the dreaded 2 year molars! 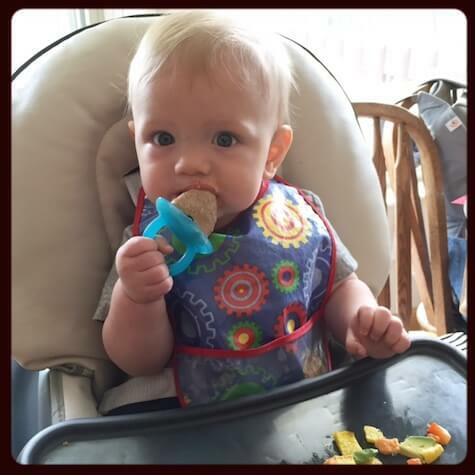 Remember to supervise your baby when he/she is gnawing on a fruit or veggie teether to avoid choking. Thanks for sharing these! My baby is not quite teething but dangerously close and I’m dreading it, but I love all these ideas! Thanks! It will be here before you know it! I love the all natural teething ideas. Seems so much better than putting a piece of manufactured plastic in their mouths! Seriously stop it. How cute are your little babies!! I’m totally pinning this for later reference. 🙂 Great ideas! She will be there before you know it! Natural is ALWAYS best! Love this post and will share with my sis in law who is due next month! Congrats to her! Thanks for sharing! Really good idea! Thanks for sharing!